Motherhood is one of the best experiences in the world. But you can make it more fulfilling by not ignoring your personal well-being. 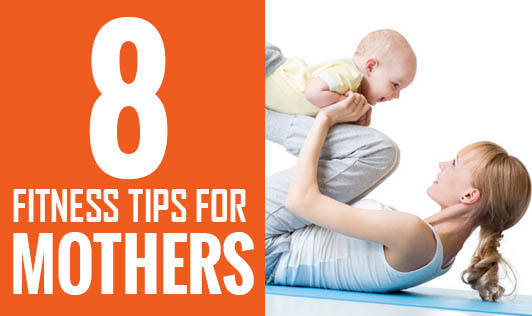 These 8 fitness tips will ensure you stay fit, healthy, and happy to enjoy motherhood. Yoga: Asanas like pranayama, suryanamaskar, and padmasana are designed to ensure fitness as well as keep stress away. Walking: A brisk walk in the morning and a casual stroll every now and then can help with better posture, clear the mind, and make one feel rejuvenated. Aerobics: Participating in a regular fitness program can keep you motivated and make you feel happy. Enjoying some me-time: Enjoy a time-out, at least 20 minutes/day to make sure that you rejuvenate your system. Jogging: You can jog at home or outside. Jogging is a great way to lose weight and build stamina. It also releases the "feel-good" hormones - endorphins. Playing a sport: Joining a sport is one of the easiest ways to quickly torch extra calories. Try tennis or badminton. Dance: Dance like nobody is watching. You can do this even at home. Just play some peppy music and get your groove on. Eating healthy: Increase fruits and vegetables in diet, drink more water, and cut-out on oil and fats. These simple fitness routines will help you get your fitness back on track and improve the overall quality of life.